Effective strength training requires good technique, correct workout frequency and duration, and the use of the right amount of weight. The weight you use will determine the type and the speed of your results. One way to calculate the proper weight to lift is by determining your maximum weight load. Your one-rep max, or 1RM, is the heaviest weight load you can successfully lift once with good technique. The American Council on Exercise recommends using a training weight that is 60 to 80 percent of your 1RM. Perform your 1RM for each of the strength-training exercises you want to test. Select one exercise a day so you do not risk injuries. 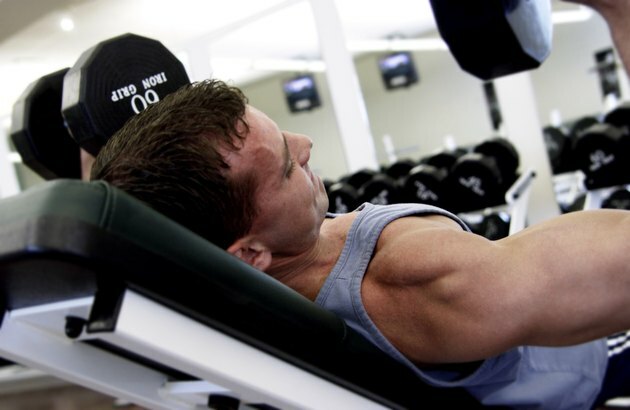 For example, max out your biceps on Monday with an arm curl. Max out your chest on Tuesday with a bench press, and then on Thursday max out your legs with a squat. Choose an amount of weight you can lift 10 times. For example, select a 45-pound barbell and perform 10 bench presses. If you are a practiced lifter, start at a heavier weight to save time. Recruit a spotter to protect yourself from injuries when testing your maximum weight, especially for exercises such as a bench press and squat. Never perform your 1RM alone. Add weight and do one repetition, then progressively add more weight before each subsequent repetition. For example, increase the weight by 10 pounds at a time until you reach your final sets, then increase the weight by 2.5 to 5 pounds. Aim to find your 1RM within five or six sets. Rest for two to three minutes between each max-out attempt. Determine your 1RM as the heaviest amount of weight you are able to lift for one repetition. Maintain proper form throughout the entire movement. When doing the bench press, keep your hands positioned slightly wider than your shoulders, lower the weight until the bar touches your chest and lift the weight until you have only a slight bend in your elbows. If you are unable to maintain proper form, you have passed your maximum weight. Test your 1RM once a month for your first six to 12 months as a weight lifter to track your progress. Test your 1RM every two or three months after that first year so you can adjust your training weight if necessary. Before your begin any exercise program, speak with your doctor regarding the safety of the workout for you.